The Sierra Foothills are brimming with things to do and places to see. 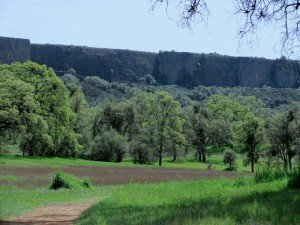 One of the multitude of fantastic sites is the Tuolumne Table Mountain, near Jamestown. While Jamestown is just twenty miles south of Murphys, the sites and activities between Murphys and Jamestown could easily fill a day. The gorgeous location, one of the best assortment of wildflowers around and breathtaking views make it an ideal hiking spot. The Tuolumne Table Mountain hiking path is a 2.7 mile loop trail located near Jamestown. The trail (which takes about an hour to walk) is rated as moderate and is primarily used for hiking. The hike itself is easy for those in good shape, but a bit more moderate for those who can get winded easily. There are a few switchbacks and steep climbs but, all in all, it’s a hike that most can enjoy. Autumn and spring are the ideal times to experience this hike as it can get a little toasty in the summertime. What makes the area so interesting is the story of the formation of the mountain itself. A volcanic eruption over nine million years ago sent lava flooding into the river at the base of the volcano, hardening as it cooled. Over time, the softer soils around the igneous rock eroded away, leaving an inverted valley. Think of it as pouring plaster into a mold, then tearing the mold away. Plant life thrive in igneous rock, hence the beautiful and copious wildflowers the area is known for. Start off with a bite of breakfast (Grounds has fresh baked scones that would do the trick, nicely), work your way around Table Mountain on foot (while working on your photography skills), then stop in at Jamestown’s historic National Hotel & Restaurant (restored to its Gold Rush glory days, the restaurant serves an incredible lunch). Lake New Melones is right around the corner and serves as the perfect spot to unwind with a little swimming, boating or fishing. On your way back to Murphys, stop off in Angels Camp for some Italian fare at Crusco’s and then head back into town for a nightcap at one of the local tasting rooms.